Healthy and Empowered communities can survive thrive and transform. 10th October 2016 Residents from Kibuku line up at the Kibuku Health Center III waiting to see a specialist during the Kibuku medical camp on 9th October 2016. As Uganda celebrated and commemorated its 54th National Independence Day on Sunday 9th October 2016, hundreds of Kibuku district residents and nearby districts of Budakar, Palisa and Butalejja could not miss out on the offer of free medical services and health education and promotion information that had been brought closer to the community through the Bagwere Batakangane medical outreach camp. The camp organized by the Bagwere youths residing in Kampala Uganda’s capital in partnership with Uganda Youth and Adolescents Health Forum, Youth Equality Center Uganda and Public Heath Ambassadors saw over 800 people turn up to receive a range of health services and information ranging from HIV counseling and testing, family planning services, cervical and breast cancer screening, dental and optical services, malaria screening, deworming for children, free condoms distribution for both male and female, Menstruation hygiene and management education, sexuality education on making rights choices, dialogue, information sharing and learning on breaking myths, stigma and barriers that hinder adequate utilization of contraceptive services among others. Women who had turned up for free medical services line up to register for cervical and breast cancer screening as well as other reproductive and maternal health services. Kibuku district located is in Eastern region of Uganda approximately 200 Km from the capital Kampala and was cut from Palisa District through the decentralization policy. The district has a population of approximately 100,000 people with over three sub-counties. The district neighbors: Namutumba district to the west; Budaka to the east, Butaleja to the south and Pallisa to the North. Patients seeking treatment at Kibukus’ health facilities have to endure sleeping on beds without mattresses or buy papyrus mats to spread on the floor. Buseta Health Centre III in Kibuku District has only three beds besides having challenges such as drug stock-out and overwhelming numbers of patients. It is estimated that more than 23,000 people depend on this facility and other facilities like Kibuku HC IV for medical treatment. Conditions at night are said to be worse with patients and their caretakers fighting for space on the ward floors and corridors. In the picture above is the outpatient department of KIBUKU HC IV and resting down under th tree are some of the women that had come for the medical camp who were waiting to see a medical specialist for screening. The number of inpatients in the various health centres is overwhelming and yet the facilities are constrained. There are limited spaces, shortage of drugs, supplies and medical workers. The district also faces high maternal and child mortality rates, malaria illnesses commonly among pregnant women and children. The under five mortality rates are also still high in Kibuku with many children succumbing to malnutrition, malarial, phenomena, diarrhea, chorela among other preventable illnesses. It was against this background that as young people we decided to take action and run to the rescue of residents of Kibuku district through mobilizing a mass medical outreach camp that would bring a variety of general health care and medical services nearer to the residents and at a free cost. Our teams worked tireless, to make sure over 800 people that turned up received the various services that ranged from antenatal care, postnatal care, family planning services and information, dental and optical care services, basic surgeries like herniorphy, cervical and breast cancer screening, STI screening and management, safe male circumcision, malaria prophylaxis, health education and promotion on evidence based practices like nutrition, malarial prevention, breast feeding, immunization, sanitation and hygiene, menstrual hygiene and management among others. Our team also took it to the streets of Kibuku town where we staged a street flash mob using music, dance and art to communicate various health promotional messages to the street dwellers and residents. We distributed over 10,000 male condoms and IEC materials along the streets and engaged residents in dialogues and discussions on various issues but majorly issues related to promoting maternal and child health, increasing male involvement in maternal health, increasing uptake of antenatal care and health facility deliveries, use of family planning services to prevent unplanned pregnancies proper spacing for child birth by couples among others. UYAHF, PHAU and YEC peer educators and community health ambassadors spreading the health promotion and education messages on the streets of Kibuku through dance and street based based dialogue. UYAHF team leader Patrick Mwesigye, the PHAU program manager Segawa and Sr. Taliba Christine the in charge Maternal and Child Health at Kibuku HC III facilitated a community dialogue on family planning and contraceptive use. The participatory discussions saw participants and mainly young men and women engaged in discussion that addressed barriers to access and utilization of contraceptive services. Some of the major barriers raised were, stalk outs, legal barriers with age constraints especially for sexually active adolescent girls and boys, gaps in confidentiality, severe side effects like abdominal pain, abdominal cramps, headache, negative perceptions and violence from male partners, negative religious and cultural beliefs among others. Patrick Mwesigy Team Leader UYAHF facilitating a session on contraceptive access for young people at the community dialogue as one of the medical camp activities. 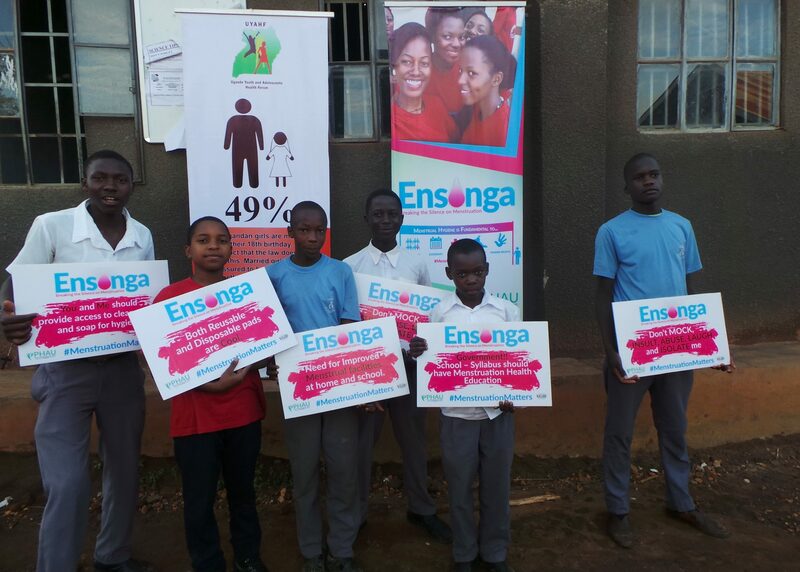 The facilitators took members through lessons on correct and consistent use of male and female condoms. Sr. Christine also sharedwith young people about the different methods of contraceptives services available at the health facilities and how they are used. Sr. Christine encouraged men to come with their wives to health facilities to seek services and make decisions together on which contraceptive methods they prefer to use. Sr. Christine the In-charge Maternal and Child health department at Kibuku HC IV speaking at the community dialogue session on contraceptive access for young people. Patrick Segawa from PHAU taking participants through a session on correct and consistent condom use. UYAHF and PAHU teams through their ENSONGA campaign a camping aimed at breaking the menstruation stigma could not miss to educate the public on issues of menstruation hygiene and management. Gorrettie, the SRHR officer from UYAHF, called on communities and men to support women and girls during menstruation by creating a favorable environment that promotes menstruation with dignity especially school going girls. She called on parents to support their daughters and provide them sanitary materials as well as engage the school management to make sure that schools provide favorable menstrual hygiene facilities like washing rooms, changing and disposable facilities. The outreach also saw close to 100 people, donate blood with support of the Uganda Blood Bank services which sent they team to camp with us. Information on the relevancy of blood donation was passed on to the community by the Uganda Blood Bank services and the community appreciated the need for donating blood to save lives. This camp was organized under the theme; healthy communities can survive and thrive. This entry was posted in Uncategorized on October 31, 2016 by patsewa.